I joined the Rangewood RFB in 2006 as a fire fighter before becoming Fifth Officer and Secretary in 2008. 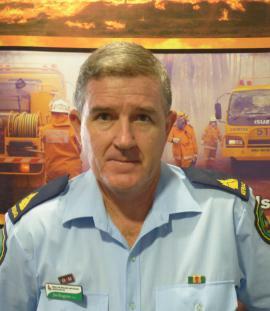 At this time I also became involved in the management of the Thuringowa Group of Brigades. Having occupied the position of the Brigade's First Officer/Secretary since 2010 and have witnessed the Brigade undergo considerable growth in membership and Brigade assets which has also allowed significant changes in the Brigade's operational focus. I have been actively involved in developing strong relationships with government agencies, and also with the Australian Army, which has resulted in many of their members joining the Brigade. Establishing these connections and working with the local land owners has also helped the Brigade to develop its own effective local Fire Management Group. During my working career, I have been employed for over 30 years in management roles in both retail and service industries across various locations in Queensland and northern New South Wales.